Little Swamp Creek: Salmon Watcher Annual Report for 2008 Is Out! Little Swamp Creek is included in the information for the Sammamish River Tributaries, starting on page 29 of the report. Unfortunately, the count was a big zero for my site (the stretch in our yard). I also did not see any fish at my site on Swamp Creek where it goes under Bothell Way/Hwy 522. Luckily Eric spotted quite a few Sockeye and Kokanee at his site on Little Bear Creek in Woodinville near McLendon Hardware. 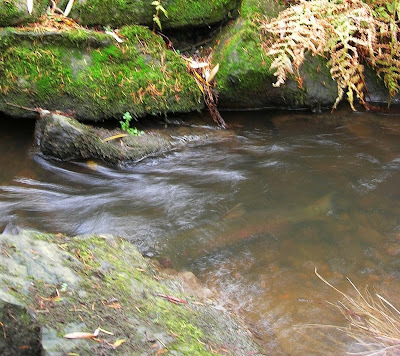 We saw a lonely male Coho pass through the stretch of the creek in our yard in November of 2006, and a pair of coho seemed to build a redd and spawn here back in 2001 (I became a salmon watcher in 2002 to make sure it was recorded officially somewhere that salmon were still coming up Little Swamp Creek). Our neighbors who have lived on our street since the 40's and 50's describe a time when there were lots and lots of salmon in the creek.